~ THE LAZY VEGAN ~ HOME OF PACO & LUIGI AND FRIENDS: The Couch is Now in the Cabin and Other Riveting Tidbits at the Lazy Vegan! The Couch is Now in the Cabin and Other Riveting Tidbits at the Lazy Vegan! 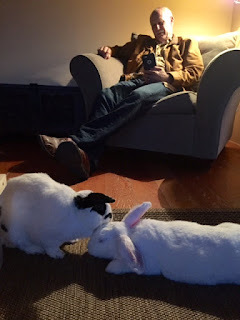 Faithful blog readers may recall that a certain rabbit by the name of Wasabi had been engaging in some "bunstruction" lately on our living room couch here at the Lazy Vegan. She became so focused on this project that nothing deterred her. 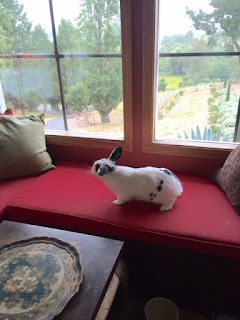 Hence, the couch was moved into the cabin - making for a wonderful new napping spot for the humans! A chair replaced the couch and with some minor adjustments - mainly the moving of the carpet, which Wasabi thankfully will not venture off of - has thus far remained intact. Rufus has explored it but he's not into the same level of bunstruction that Wasabi is! To make room for the couch, the cabin was cleaned and is probably now the neatest it has ever been - making that potential cabin nap all the more appealing! 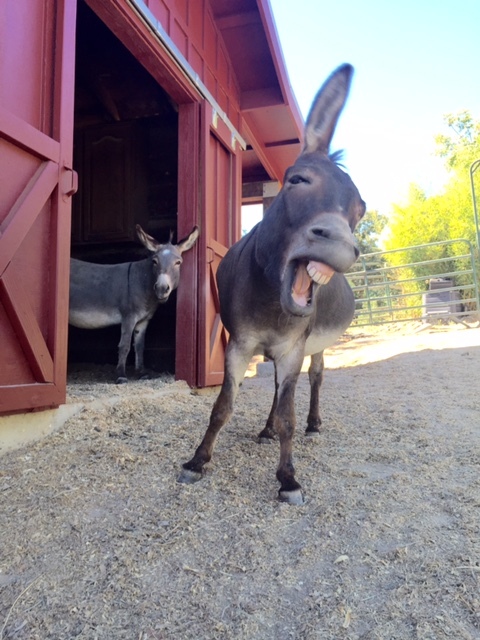 All the good jokes are told down at the barn. Perhaps because she missed the couch so much, Wasabi suddenly hopped up on the window seat the other day. Luckily, it only happened once, and she seemed rather stunned to be there. 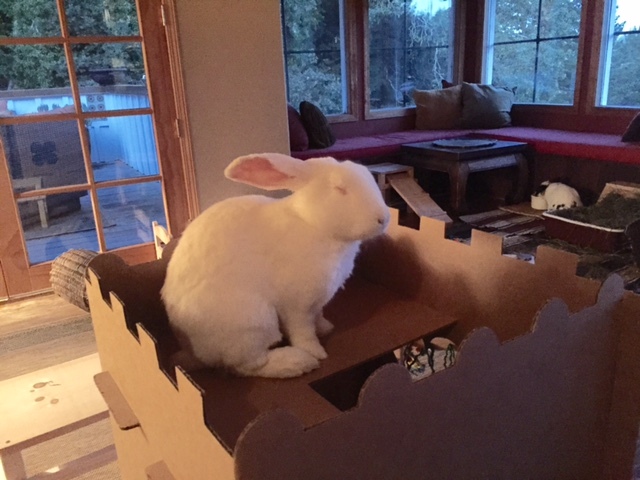 This rabbit can sleep anywhere! Wasabi STILL grooms her stuffies! More evidence of Rufus being able to sleep anywhere. 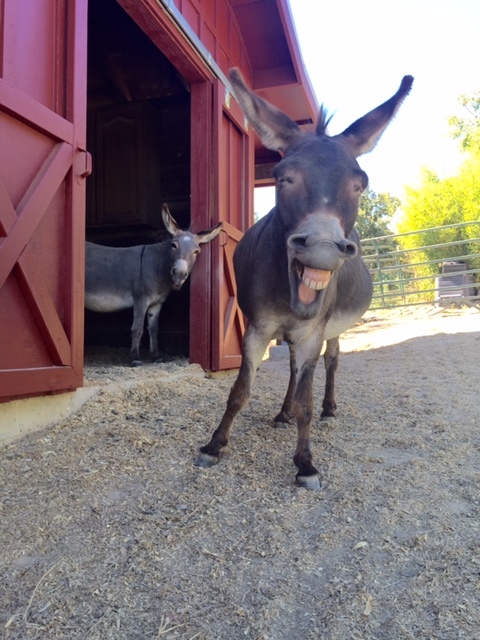 More goofing around at the barn! CLEAN cabin! With a couch. Never get tired of the new red barn! 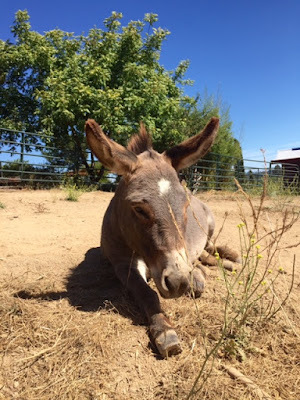 We have noticed many times this week that Wasabi has "asked" Rufus (via body language) to be groomed, but so far he has not done any grooming back! This was a first this past week - using the same litterbox! Nobunny ever said that togetherness would be riveting. Say "vegan cheese" and smile! Rufus checks out the new living room arrangement.